Chelsea Green Publishing Company, 9781603585040, 205pp. Never before have so many Americans been more frustrated with our economic system, more fearful that it is failing, or more open to fresh ideas about a new one. The seeds of a new movement demanding change are forming. But just what is this thing called a new economy, and how might it take shape in America? In What Then Must We Do? Gar Alperovitz speaks directly to the reader about where we find ourselves in history, why the time is right for a new-economy movement to coalesce, what it means to build a new system to replace the crumbling one, and how we might begin. He also suggests what the next system might look like--and where we can see its outlines, like an image slowly emerging in the developing trays of a photographer's darkroom, already taking shape. He proposes a possible next system that is not corporate capitalism, not state socialism, but something else entirely--and something entirely American. 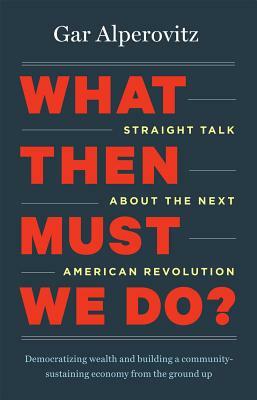 Alperovitz calls for an evolution, not a revolution, out of the old system and into the new. That new system would democratize the ownership of wealth, strengthen communities in diverse ways, and be governed by policies and institutions sophisticated enough to manage a large-scale, powerful economy. For the growing group of Americans pacing at the edge of confidence in the old system, or already among its detractors, What Then Must We Do? offers an elegant solution for moving from anger to strategy.